When prices get too steep inside Cannes itself, savvy travellers to the Cannes Film Festival, Mipim and MIPTV head east or west for better deals. On the eastern side, you have two towns with plenty of accommodation: Antibes and Juan-les-Pins. 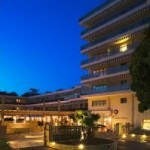 The 3-star Strelitizias Hotel is located behind a leafy park in Juan-les-Pins, just off the Boulevard Raymond Poincaré. 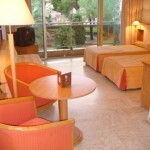 We paid a special rate of just €90 for a two people, although the average rate of about €120 is still good value. The building is smart, with palm trees and a fountain out front. The reception is just off the large dining and breakfast room. The staff were helpful, speaking French and English where necessary. The real surprise came in the room, which featured a small corridor with closets that led to a large bright bedroom. In our case, we had a view of the park, which was fine, although the sound of traffic was very clear when the windows were opened. Overall, the room was very comfortable with a feeble WiFi connection that was enough to check e-mail, etc. We skipped breakfast, which was pricy, as I also prefer grabbing breakfast over the market dailies inside the Palais each morning. People that stay outside Cannes wonder about getting back at night. Les Strelitzias is about a 10-minute walk to the railway station of Juan-les-Pins, which lies on routes 03a ad 04r. During the day, there are trains roughly every 20 minutes. But it’s worth picking up a timetable in the station to make sure you allow enough time. Getting to the Palais from Cannes station takes about 10 minutes. The last train back to Juan-les-Pins is currently just before midnight. What’s more, the hotel can be reached straight from Nice airport by bus n° 200, which continues on to Cannes. This is a great deal if you get in after 8pm and baulk at the idea of paying €90 or more for a taxi. Two downsides: it’s hard to know where to get off and this is the local bus. So it takes well over an hour to get to Juan-les-Pins. A timetable can be found at reception. The nearest bus stop is “Jardin Pauline” in front of a park, after “Régence”. Ask about the availability of night buses to and from Cannes. OVERALL: If you’re willing to travel in the morning, Les Strelitzias is warmly recommended for a comfortable stay making it a good value hotel for staying in Cannes or Juan-les-Pins. In case you are wondering, a strelitiza is a South American flower (my first guess was an Austrian count). I stayed there once. Nice enough, but look out for that bus timetable. They were all full on a Saturday afternoon and I had to pay €30 for a cab into Cannes.